A spectacular collision between galaxies has been spotted near the Milky Way. Two small star systems are slamming into each other, producing a colourful firework display. Discovered by academics from the University of Manchester and the University of Hong Kong, the so-called ‘bull's-eye’ collision is happening just 30 million light years away from Earth, in a relatively nearby galaxy. Shock-waves from the collision compress reservoirs of gas in each galaxy and trigger the formation of new stars. This creates a spectacular ring of intense emission, and lights up the system like a Catherine wheel on bonfire night. Such systems are very rare and arise from collisions between two galaxies of similar mass. The closest such system ever found, the discovery is announced today by a team of astronomers led by Professor Quentin Parker at the University of Hong-Kong and Professor Albert Zijlstra at the University of Manchester. The scientists publish their results in the journal Monthly Notices of the Royal Astronomical Society. It has been dubbed “Kathryn’s wheel” both after the famous firework that it resembles, but also after Kathryn Zijlstra, who is married to Prof Zijlstra. Galaxies grow through collisions but it is rare to catch one in the process, and extremely rare to see a bull's-eye collision in progress. Fewer than 20 systems with complete rings are known. Kathryn's Wheel was discovered during a special wide field survey of the Southern Milky Way undertaken with the UK Schmidt Telescope in Australia. It used a narrow wavelength optical region centred on the so-called red “H-alpha” emission line of Hydrogen gas. This rare jewel was uncovered during a search of the survey images for the remnants of dying stars in our Milky Way. The authors were very surprised to also find this spectacular cosmic ring, sitting remotely behind the dust and gas of the Milky Way in the constellation of Ara (the Altar). The newly discovered ring galaxy is seven times closer than anything found before, and forty times closer than the most famous example of collisional ring galaxies, the ‘Cartwheel’ galaxy. Kathryn's Wheel is located behind a dense star field and close to a very bright foreground star, which is why it had not been noted before. There are very few other galaxies in its neighbourhood: the odds of a collision in such an empty region of space are low. 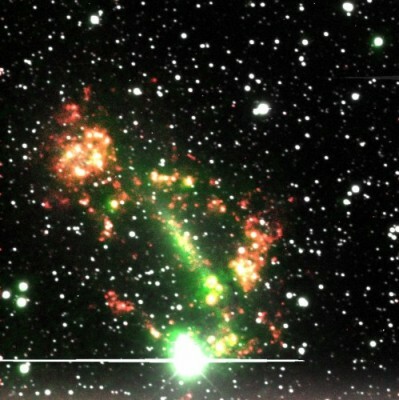 Professor Zijlstra said: “This is a very exciting find because it will allow astronomers to study how collisions cause star formation, how long the collision takes, and what types of stars form. Smaller galaxies are more common than large ones, implying that collisional rings could be ten times as common as previously thought. The authors intend more detailed studies on larger telescopes since the system is currently the only one of its kind close enough to permit study in high detail.